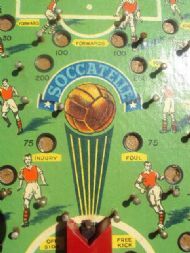 A representative of the many types of bagatelle style football games available over the years. 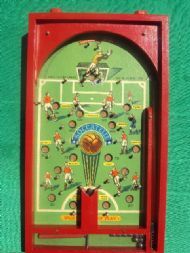 This one is a Chad Valley Miniature Soccatelle game. Wooden with ball bearings. Lovely graphics and design. The original version can be seen here. A really well crafted and sturdy game but made in a very small size - less than a foot high. Very nicely designed graphics on the game board - but why do Chad Valley always use the Arse kit in their games? It does them no credit and greatly reduces the appeal of their games. Basic cardboard box with sticky label. Nothing else to say really!